A second woman who came forward to accuse Supreme Court nominee Brett Kavanaugh of inappropriate behavior, Deborah Ramirez, now admits “significant gaps in her memories” regarding the 1980s college party in question. Observers also noted that the new allegations came to light over the weekend after Ramirez had for six days consulted with a Democratic lawyer. Leftist billionaire George Soros has been directly tied to the attorney representing the first accuser, Christina Blasey Ford, and at least one group that has been scouring Kavanaugh’s past for potential new accusations which could derail the nomination. The New York Times reported that it had spent a week investing the new accusation but was unable to find an eyewitness and that Ramirez had recently told several of her classmates she wasn’t sure it was Kavanaugh. The new accusation allegedly occurred 1983 at a party when Ramirez and Kavanaugh were freshmen at Yale. “I have no recollection,” said a second person she claimed was an eye-witness. Four Yale graduates who were friends with both Kavanaugh and Ramirez said “with confidence” if the episode had ever occurred, they “would have seen or heard about it — and we did not.” They add that it “would be completely out of character for Brett,” and the first Ramirez said anything about it was when Kavanaugh was nominated for the Supreme Court. Christine Blasey Ford came forward in The Washington Post alleging that Kavanaugh assaulted her while he was age 17 and she was age 15, though she does not remember many key details. Despite focused efforts by Democratic political operatives and left-wing lawyer Debra Katz, the Blasey Ford’s account appears to be unraveling. Each of the four people she claimed to be present at a 1982 party where she claimed an intoxicated Kavanaugh assaulted her have either denied her account or said they have no knowledge of it. Meanwhile, the major media have spotlighted the Georgetown Prep yearbooks of Kavanaugh which reportedly detail the Supreme Court nominee’s days as a high school party boy. The same media have been silent since the Holton-Arms yearbooks of Blasey Ford were scrubbed from the Internet. Those yearbooks reveal “that Animal House had nothing on the infamous Holton party scene,” the Cult of the 1st Amendment blog reported on Sept. 19. Christine ‘Chrissy’ Blasey, right, in Holton-Arms yearbook photo. 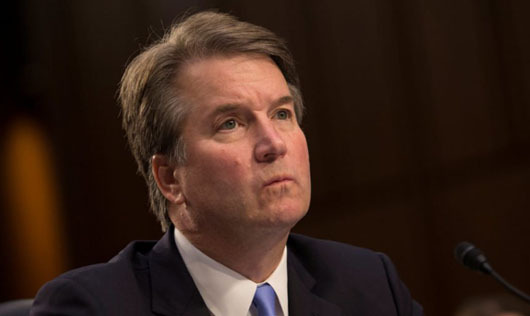 Kavanaugh graduated from Georgetown Prep in 1983. Blasey Ford graduated from Holton-Arms in 1984. The Holton-Arms yearbooks “are a testament to the incredible power these girls had over their teachers, parents and the boys of Georgetown Prep, Landon and other schools in the area” and include “multiple photos and references to binge drinking and the accompanying joy of not being able to remember any of it,” the blog said. 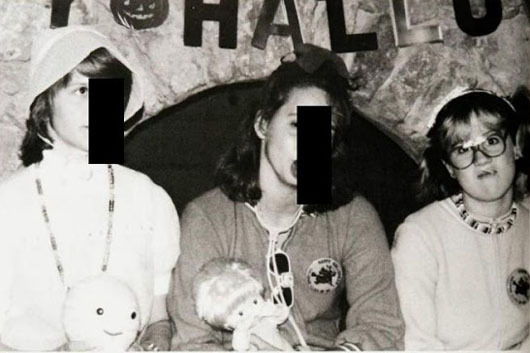 In the 1984 Holton yearbook, approved by the faculty, Blasey Ford, often referred to as ‘Chrissy,’ is pictured at a Halloween party in her junior year. In another section of the yearbook, the editors discuss a house party where, “we were confronted by…a pair of veiled terrorists, [two redacted names], were the guns real or did you just want to get served first?” There is also a photo of two Holton girls in makeshift burqas, holding automatic pistols. Meanwhile, it was revealed that Democratic operative and former Clinton White House official Ricki Seidman in a July conference call to Democrat leaders, laid out a strategy to derail Kavanaugh’s nomination. “Over the coming days and weeks there will be a strategy that will emerge, and I think it’s possible that that strategy might ultimately defeat the nominee,” Seidman said during the call. Seidman is currently an adviser to Blasey Ford. Conservative pundit and former Reagan and George H.W. Bush administration official Bill Bennett said the Kavanaugh saga has exposed a clear double standard among Democrats. Bennett asked where the outcry was over former Sen. Ted Kennedy’s involvement in a 1969 car crash on Chappaquiddick Island in Massachusetts that left a woman dead.